That GIF is the best! 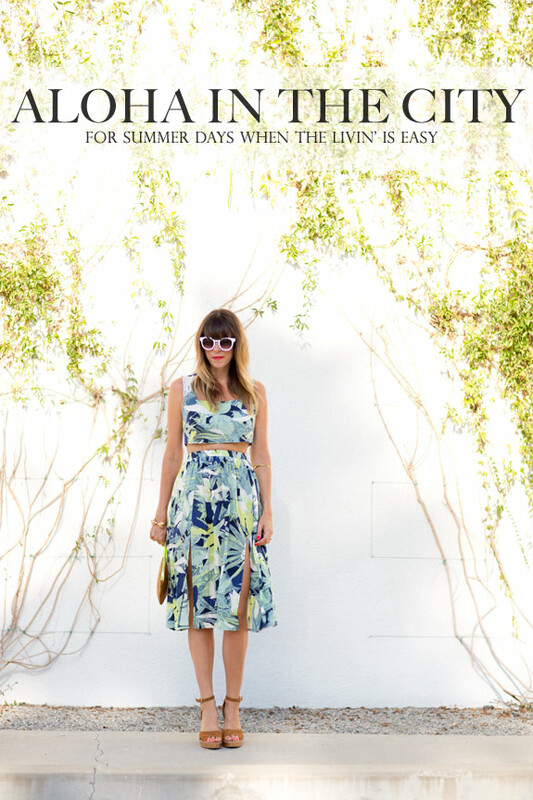 This is seriously such a dreamy summer outfit! I love this! I always feel so overwhelmed when I walk into topshop. I think you have to be great fashion hunter to sort through the mess for the jems! super chic! i am loving the matched separates, especially with a healthy dose of crop! This is super cute and for some reason completely reminds me of Megan from Mad Men. Love it! I am just as in love with them as you! And I'm going to have to get my bum to TopShop soon. First, love the look. The print, the silhouette, the accessories. All picture perfect. Second – That GIF is freaking AWESOME. Love it! I love the print. The colors are really pretty. You could work as a hula hula dancer. 😉 I need that skirt in my closet. LOVE the outfit, and how you styled it. And I love that little GIF at the end! I need to figure out how to do that! Oh my goodness. You're the cutest. Love, love, love this look! I cannot get enough of the palm print this season and this set is especially cool because it has that retro feel. That really is such a cute look. Can't wait to see how you mix it up. PS- Your locations are awesome! If you ever had a spare moment or needed a topic to blog about, I'd love to hear the details of a typical location scout. I really love this outfit! Do you know of any places that are selling a similar outfit? I don't think topshop is carrying it or anything like it anymore!